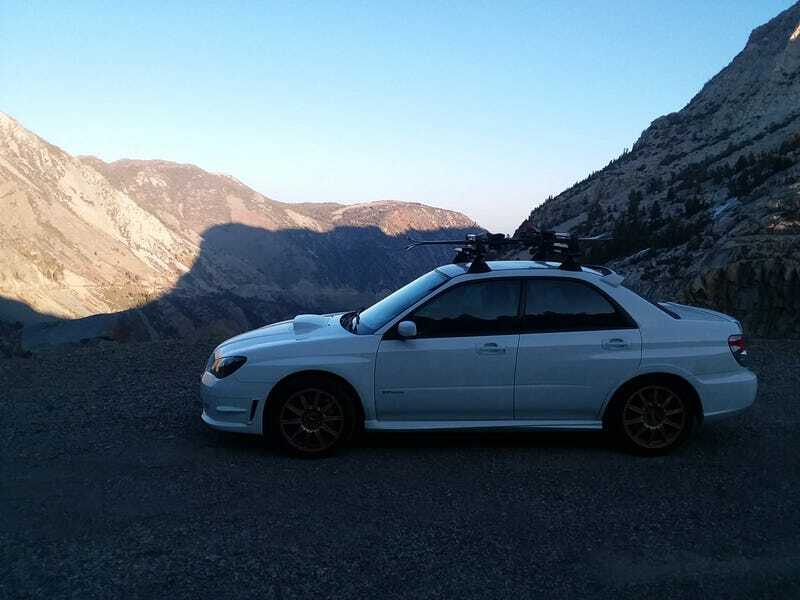 Since I have had my STi now for 1 full year, I figured it was time to write up a short review on the vehicle. I bought the car in November 2017 shortly after moving across the country in order to have a “normal but fun” daily driver to supplement my Miata and could also get me to ski mountains easily. I have always had a lust for the 2002-2007 Subaru WRX/STi and actually was shopping for one before I even got my Miata. My budget was putting me at only beat to crap, modded to hell or rusty early examples though so I am glad that I waited. For this purchase, I scowered NASIOC primarily until I came across the perfect example. My main priority became 2004-2007 WRX or Saab 9-2x Aero. Somehow though, I found this particular STi listed for $13.5k in great shape and surprisingly nothing wrong with it beyond bald tires! It had some typical small dents and paint chips for a 12 year old car with 136k miles on it. Headgaskets had recently been replaced (to the tune of $3500 by the PO) and the PPI turned up no further issues than the aforementioned tires. With the details finalized during my cross country drive, I was able to pick up the Subaru at the end of my first week living in LA. It was exciting to pick up the car, go for my first drive (about an hour) to home, and then spend some time driving it around and getting used to it over the weekend. Being totally stock mechanically and only minor aesthetic mods, I made no plans to ruin the car with stupid mods and only thought about the many trips I would take it on. Those minor aesthetic mods though included the trunk spoiler delete and headlight housing coloring. It’s funny because I actually thought the headlights were OEM because of how professionally done and how common it is on these. Of course a full rally-spec mod package and some kind of wild WRB paint job was my dream. But I wanted this car to be my daily driver so the only mods I have done in the first year were 50% ceramic tints all around (no windshield tint though) and the roof rack for my skiis. I want to pick up biking again eventually as well as surfing so that will surely come in handy for many things. My impressions of the exhaust noise stock are also somewhat lacking so a catback (BUT NOTHING ELSE) is on the short list of things to do eventually. Anyways, now for a short review. My categories are what are most relevant to me and I am not going to do numeric scores. POWER - With 300 hp and 300 lb/ft on tap, more than adequate power is a given. Especially when compared to my Miata! However, with this being somewhat of an “old school” turbo there is quite a bit of turbo lag to contend with. Either way, its lovely going up hills and in general just cruising. I feel like I can drive at 5/10ths and be going the same speed as my Miata at 11/10ths. And when I get on it and push it to 8/10ths, I having passing power for days and it just makes me giggle. I have definitely pushed it to 9.5/10ths a few times but there is no way to safely/legally use that on the street too often. The best way to describe the power though is just the right amount to never feel like I need more for the street. And also certainly enough to get me into trouble with the law but the Miata has enough for that too so its just a matter of restraint lol. PUTTING DOWN THE POWER - The symetrical AWD was one of the neat things that has drawn me to Subaru to begin with. The trick differentials in the car coupled with some stickey tires means that there has never been any wheelspin in any conditions (outside of full dirt/snow). After trying out a GTI rental, I was just so offput by torquesteer and wheelspin under even moderate acceleration from a stop. It is pretty neat to run across a patch of dirt on the road or drive in the wet and not have the rear end kick out under power. While I still prefer RWD fun for the track and canyon driving, this is awesome for daily driving purposes. Due to last winter being pitiful and having summer tires only, I didnt get to drive in much snow but I will be surely experiencing that this year on my new snow tires! GOING AROUND TURNS - Due to the near bald tires the car came with, I had a blank slate to do what I wanted and put on some quality 200TW Summer Tires. I knew they wouldnt last long but I really wanted to experience as much fun as possible with the car right away. I put on the Falken Azenis 615k+ tires and enjoyed the heck out of them for almost the whole year and about 15k miles before replacing them with the snow tires. With the Falkens on the car, every canyon run became a time attack adventure and much fun was had. At high speeds, the car felt way more planted than the Miata and way more difficult to upset with potholes, dirt, water, or other road debris. But at lower speeds around super tight turns, the car pushes a bit at the limit and generally is some work to handle. Due to the composure of the car at high speeds, sweepers are extremely fun and this car shows itself as an excellent handler. LOOKS - Those boxy fenders just scream “JDM yo” and really exemplify everything good that came from the late 90s and how the STi came along and was just a great car at the time. I am constantly left with the “look back” as I walk away. Plus Aspen White is a beautiful color and I really like how good the condition of this paint is. I am on the fence of how I feel about the spoiler delete look but this is certainly more grown up and cleaner. I dont think I would have deleted it myself but it is nice to avoid unwanted po-po attention. If California laws on tints were more lenient I definitely would have went with a darker tint as well but as is, it adds a nice look to it in the right lighting. EVERYTHING ELSE - The car gets pretty crap gas mileage (observed: 17-18 city, 20-21 combined/avg, 23-24 highway) and is pretty bumpy/noisy most of the time. Wind noise, tire noise, and interior rattling noise being the worst offenders. But surprisingly, it has proven to be reliable so far. 15,000 miles is not really a “badge of reliability” but it is decent to have nothing but regular maintenance so far. I have done a few oil changes, changed brake rotors and pads, spark plugs, a starter, and intercooler piping. Nothing has left me stranded and all of it was straightforward to swap myself. The only thing that has truly broken has been my Air Conditioning but I have tracked it down to a simple leak in the system and just need to replace some o rings and fill it. Thankfully humidity is nonexistant in Socal so even 90+ days barely necessitate AC for comfort. In traffic and once it starts getting closer to 100, its nice to have though so I will sort it out before summer rolls around again. CLOSING THOUGHTS - Overall, it has been a great daily and I look forward to using it as a practical ski trip machine soon. It is excellent in the canyons, fun for a back road cruise, and does well enough at trudging comfortably down the highway. Way better than my Miata at being “a car” so it fills the role perfectly. I am sure it would make a great track car with some minor mods too but I like track cars to be cheap and disposable! Surely things will break on this car and cost me money/headaches. But I have planned for that and will keep on top of problems as they arise. At 152,800 miles right now, it may be a “ticking time bomb” of sorts but I trust the car enough for long trips and will continue using it often. Right now it is my only car since the Miata is very broken so I am sure to drive it a bit more this year. And no I have not yet picked up vaping, wearing flat brim hats, or making sacrafices to the headgasket gods.